Talk about speeds and feeds. Underwhelmed with Apple’s new iPhone 4S, but obviously viewing it as a potential threat, Samsung is luring undecided or perhaps disappointed fans into considering the Galaxy S II smartphone. 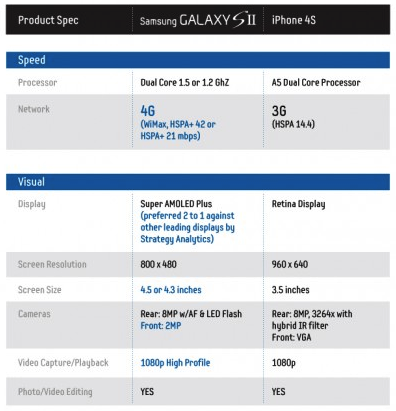 The company has issued an email to customers, attaching a convenient comparison table that pits the features of the iPhone 4S against its own Galaxy S II device. On closer inspection, however, some of the entries in Samsung’s table raise eyebrows. For example, Samsung is downplaying the importance of Siri by describing it as the ‘voice activation’ feature and comparing Siri to Vlingo, a free download from Android Market. While Vlingo is billed as the best personal assistant on Android, it isn’t as comprehensive or deeply integrated as Sir, which surprises with its conversational attitude and artificial intelligence features allowing it to learn from past interactions with the user. Also, the Cameras section in Samsung’s tablet ignores the iPhone 4S’s enhanced camera system, which is based on Sony’s lens and the improved sensor from Omnivision. The iPhone 4S’s back camera has a fifth lens, the larger f/2.4 aperture, the backside illumination sensor, as well as face detection and video stabilization capabilities, none of which Samsung bothered to mention. Instead, they tout their admittedly superb Super AMOLED Plus display which is “preferred 2 to 1 against other leading displays by Strategy Analytics”, a 1.2GHz or 1.5GHz dual-core processor (versus the A5 chip in the iPhone 4S) and, of course, 4G networking supporting WiMax, HSPA+ 42 or HSPA+ 21 MBps. Apple’s handset sports HSPA 14.4Mbps networking that marketing chief Phil Schiller said could file as 4G, but underscored Apple won’t follow in the footsteps of its rivals by misusing the term “4G”. Perhaps Apple’s decision was influenced by a new bill to force carriers to disclose real 4G speeds? Samsung’s table also underscores the openness of Android allowing for multiple app stores, music stores and online services. Finally, they are still referring to the Galaxy SII as the thinnest smartphone despite losing out the title to iPhone 4 in the U.K., per last month’s ruling by the UK Advertising Standards Authority. Go past the fold for the full speeds and feeds chart and Samsung’s email message in its entirety. Samsung’s Galaxy S smartphone series has risen to become the biggest challenger to the iPhone’s supremacy in the handset world. Samsung ten days ago announced shipments of ten million Galaxy SII units into the channel in the past five months, beating the self-imposed goal of hitting the sales mark by the end of this year. All major U.S. carriers either offer or are gearing up for the handset, although each wireless company brands the phone differently, adding their own tweaks to the international Galaxy S II version. Here are the four talking points from Samsung’s alleged email to customers. · Screen Size – benefits scale by AREA (length x width), not just diagonal; the AT&T version of the Samsung Galaxy S II has 42% more screen area and Sprint / T-Mobile versions of Galaxy S II have 58% more screen area than the iPhone 4S. · Network – The Galaxy S II HSPA+ network speeds are at least 50% faster with AT&T 21 MBPS and three times faster with T-Mobile’s 42 MBPS than the iPhone 4S’s 14 MBPS HSPA network. 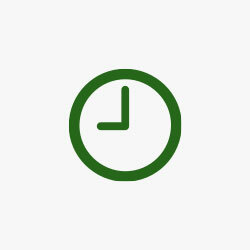 · Design – Galaxy S II continues to have the thinnest smartphone design with the fastest network speed on each of the networks carrying the smartphone (AT&T, Sprint & T-Mobile) including today’s announcement of the iPhone 4S specs for AT&T, Sprint and Verizon.